Part of Storkcraft's popular Vittoria Collection of nursery furniture, this 3 in 1 Fixed Side Convertible Crib in Black shows off graceful sleigh bed curves and a mature, modern finish on a smartly designed, fixed side crib. It's safe and sturdy, made entirely from solid wood, and built for long use and handy convenience. Use the built-in drawer to keep extra bedding close at hand. You'll love that the bed continues to adapt to your child's growth and development over the years as you lower the mattress height through three levels and effortlessly convert the crib into a day bed when the time comes. Add conversion rails, not included, and you'll even turn this beautiful piece into a full size bed that will continue to serve from early childhood and into early adulthood. 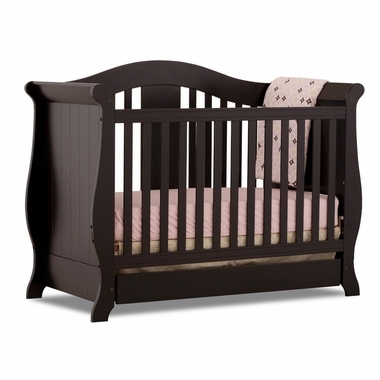 Convertible Crib measures 47.25" x 29.5" x 61"